Flavorful chicken rice seasoned with our rich and thick ketchup, wrapped carefully in a thin omelet. Omelet rice can now be ready in minutes! 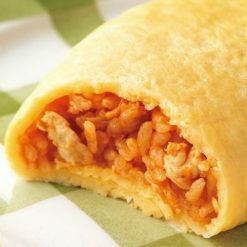 Omelet rice has been a popular, long-standing Japanese “cafe” style and diner dish, which consists of chicken rice (fried rice with pieces of chicken, seasoned with ketchup) wrapped in a crepe-like thin piece of fried egg. Sugarlady’s rich and thick Tomato Ketchup gives the robust tomato flavor to the chicken rice. 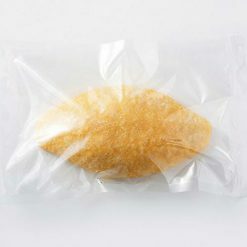 Puncture some air holes all around the bag with scissors, and heat in the microwave oven according to the following guidelines: 500W / 5 minutes 600W / 4 minutes and 40 seconds. (Cooking times are approximate. Please adjust depending on the model of the microwave oven that you own. 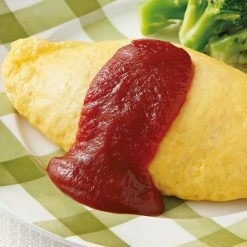 )As no extra ketchup for topping is included, please top your omelette rice with ketchup, tomato sauce, or demi-glace sauce on top as needed. Please be sure to puncture some air holes. Otherwise the content may rupture if heated without them. This product contains eggs (domestic), polished rice (domestic), vegetables (onion / domestic, carrot / domestic), chicken breast meat (domestic) tomato ketchup, vegetable oil, wheat starch, syrup reduction, fermented seasoning liquid, butter, sugar, seasoning extract (chicken extract, dextrin, yeast extract, salt, sugar, protein enzymatic decomposition product, pork extract, vegetable extract, spices), salt, tomato paste, chicken broth (salt, yeast extract, powdered soy sauce, lactose, gelatin extract, chicken extract include onion powder, garlic powder, vegetable oil, spices), vinegar (vinegar, salt), skim milk powder, pepper / trehalose, egg, milk ingredients (some may include wheat, soybeans, chicken, pork, gelatin). This product is not suitable for anyone with allergies to egg, milk, wheat, soy, chicken, pork or gelatin. Origin of ingredients: eggs, white rice, chicken (domestic). Prepared and packaged in Japan.